Just because we don’t spend much time in the hallway, doesn’t mean that it should be neglected. Whether you’re updating a modern urban home or a countryside period house, the entrance to the property sets the tone for what lies beyond it. So, make it welcoming by adding beautiful floor tiles. The hallway is one of the best places to use patterned floor tiles as the amount of space here is usually limited, and a bold pattern will not look too overwhelming. Our patterned tiles do a wondrous job of giving a hallway personality without the need for additional embellishment. Our Jet Set Collection of tiles are the perfect example of how pattern can really lift a space and add energy to it. These decorative marble tiles in a mosaic format can be installed as herringbone and 3D-illusion pattern, creating a unique piece of artwork on your hallway floor. 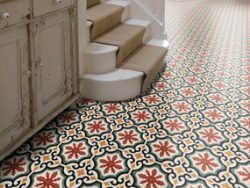 The Victorians were big fans of encaustic tiles, and many homes from the period still feature them in hallways. 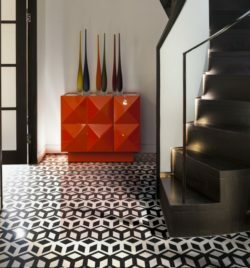 Our collection of Handmade Encaustic cement tiles – from the stunning Salisbury pattern to the charming Chequer – will not fail to make an entranceway that is a delight to come home to. We strongly believe that there’s something about natural materials that instantly adds warmth and character to any room, and what a warm welcome it makes in the hallway. The honey tones of our Jerusalem Dove Limestone tiles are not only beautiful and exceptionally hard-wearing but will immediately create a warm welcome. Adding stunning darker stone tile to a traditional-style neutral space is an effective way of transforming the area into a warm and welcoming space. Our Hazlebury Limestone Tumbled, for instance, gives confidence to an entrance way without being too overpowering. Monochrome tiles are the perfect way to give your hallway a modern twist in a classic space. 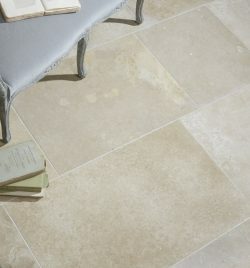 And our Zuber Limestone tumbled are no ordinary floor tiles. This beautiful pair, with the stunning creamy limestone white tiles partnered with the handsome charcoal grey stone creates a look that is both timeless and modern. Whatever the type of property you are updating give your hallway the attention it deserves. 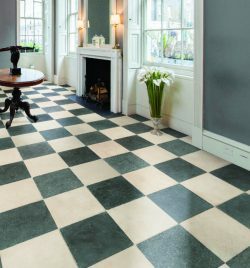 Take a look at our full range of suitable tiles and see what inspires you.